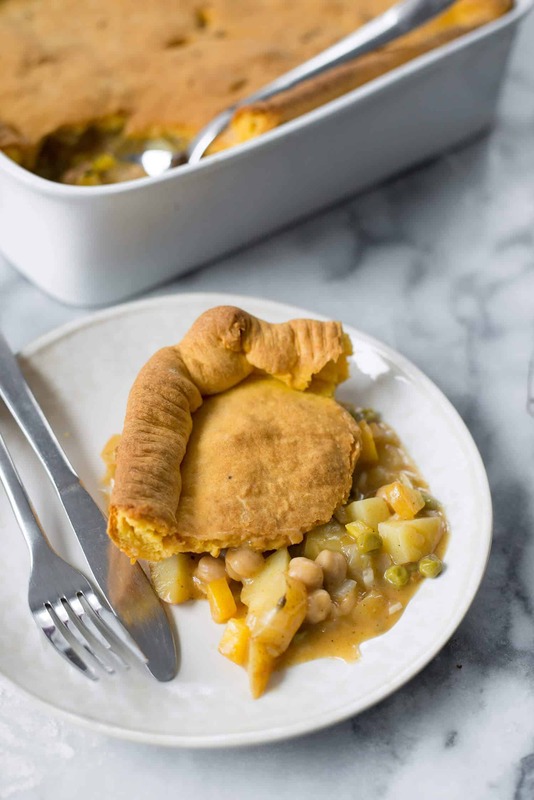 Vegan Pot Pie with Sweet Potato Crust. A cozy, must-make this winter. 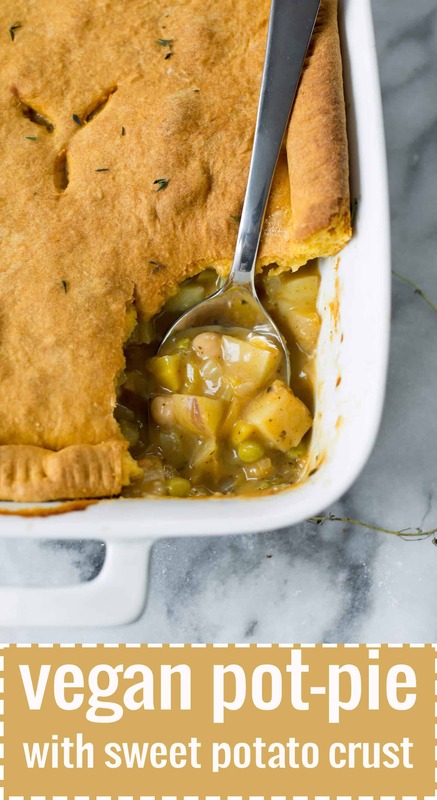 It’s time for cozy and this pot pie is the perfect meal. Heat the olive oil in a large pan. Add the onion and cook until tender, about 5 minutes. Add the carrots, celery, garlic, thyme and sage and cook until the rest of the vegetables are slightly softened, about 5 more minutes. Add in the sherry or white wine to deglaze the pan, along with the salt and freshly ground pepper. Let the wine reduce for a few minutes. Add the potatoes and the vegetable broth. Cover and bring to a boil. Then, reduce the heat and let simmer until potatoes are tender, about 5-10 minutes. Be careful not to overcook them. Add the vegetables to the base of a 9×13″ baking dish. Make the crust. Place the flour, baking powder and salt in the base of a food processor fitted with a dough blade (Can also use a large bowl). Pulse together, then add in the mashed sweet potatoes and process until just combined. Add in the butter, one tablespoon at a time and pulse a few times to combine. Slowly drizzle in the water, 1 tablespoon at a time, until dough forms a ball. Remove from processor and dust with flour. Roll out the dough to a thin layer, you may need to dust with additional flour to prevent sticking. Cover casserole dish with dough and pinch edges all the way around until sealed. Make several small slits in the dough. Bake until crust is golden-brown, about 35-40 minutes. Previous Post: « Holiday Gift Guide: Favorite Cookbooks! Thanks Karlie, hope you like it! This looks fascinating. There’s a direction to “see notes”, but I don’t see any notes… Never added sweet potato to a crust before! Love the sweet potato crust! What a great meal to feed a crowd too! Pinning to make for dinner ASAP! 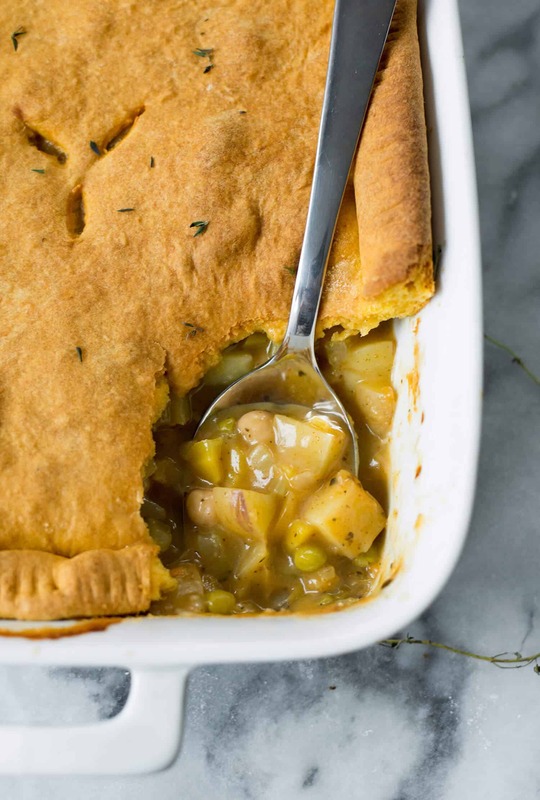 Pot pie is always such a comforting meal, love the use of sweet potato in the crust, I will have to try it out sometime. I see chickpeas and green peas in the picture, but they are not listed in the ingredients for the pie. What quantities did you use? Hi Michelle, thanks for the comment. Gosh, I have no idea what happened with this post- looks like all my writing is missing as well! Ah, I’ve updated it now- hope it’s not too late! I will be making this one again! I had to make a few switches with the veggies because i was out of a few things, but it still turned out great and we LOVED the sweet potato crust! Awesome! Glad that you liked it, thanks Mandie! Any other substations for the chickapeas?